The bobcat is a species of wild cat that ranges from southern Canada to northern Mexico, inhabiting the continental United States in between. The animal's name comes from its short, "bobbed" tail. Bobcats range from 15-30 pounds (average is 15-20) and 28-47 inches long, tail included. From ground to shoulder, they stand around fourteen inches. 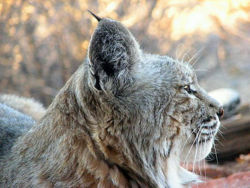 While similar to the lynx, the bobcat can be told apart by its longer tail, with its black color near the end and white tip, as well as its furrier coat. With excellent vision, hearing, and smell, the bobcat is a good hunter. The animal is also an exceptional climber and a competent swimmer, though it has a tendency to avoid water. Its forelegs are shorter than its hind legs, resulting in a bobbing run. Depending on the habitat bobcats differ in color. Whether this is natural selection or some “other hand at work” remains to be seen. In desert regions such as the Great Plains a bobcat's fur usually has a shade of tawny gray splashed in, while bobcats in wooded areas and places of thick underbrush have rust colored tones in their fur. Consequentially a bobcat's coloring in an urban environment most likely depends on what type of environmental regions are close by. It is yet to be determined if rural living bobcats have a slight fur coloration difference then those that live elsewhere, along with swaps and mountains regions. Bobcat at Mount Tamalpais State park. Stinson Beach, California. Bobcats reproduce sexually just like house cats do. By the second summer of life all bobcats become sexually active. Bobcats usually breed from winter to the beginning of spring. The gestation period is around 62 days. The female is left to raise the litter alone. The young bob cats will not leave the mother for about a year. 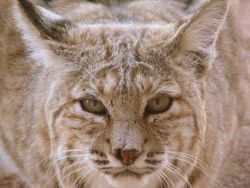 Bobcats live throughout the eastern United States, being hindered not so much by environment, but rather by the availability of prey and shelter. They inhabit woods, deserts, swamps, mountains, and urban areas. Bobcats don’t make their own dens, and they will sleep in deep underbrush, natural caves, hollowed out trees and logs, or boxes. Bobcats eat small game such as mice, rabbits, gophers and other small rodents and smaller birds. But near livestock they have been known to feed on baby pigs, lambs, and poultry. When in urban areas bobcats may eat, but are not limited to: small children, house hold cats, pigeons, crows, song birds, squirrels, and small dogs. picture of a dead bobcat by Patrick Dockens. Urbanization has intruded upon the wild habitats of many bobcats. In response, these bobcats have adapted to the urban environment, avoiding the extinction that has befallen many other creatures. However, there are still adequate amounts of bobcats in the wild for them not to be classified as an endangered species. In some areas, farmers are allowed to kill bobcats in order to protect their livestock, and there is also an open bobcat hunting season. Nonetheless, the bobcat has garnered enough endearment from the populace that 2nd year cub scouts are named after the animal. This page was last modified on 13 January 2011, at 22:34.